Game Drop Zone: Review - Helldivers, The Aliens Are The Bad Guys Right? Using earth-shattering Hellpods to deliver lethal doses of democracy from orbit, is the primary role of a Helldiver, they are the scalpel, the surgical instrument in humanity’s arsenal. 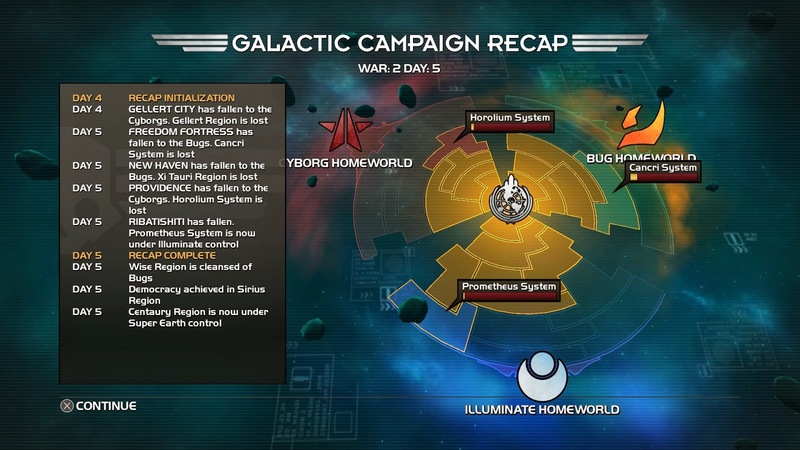 Humanity; the exceedingly patriotic inhabitants of Super Earth, have finally reached the stars, and fuelled by their fiery devotion to democracy, have begun a righteous campaign of genocide on galactic scale. Helldivers doesn't shy away from its inspirations, Starship Troopers chief among these, though some of the art and character designs are distinctly Warhammer 40K. Reading some of the encyclopaedia entries, specifically Super Earth’s history and politics, adds particular flavour to the Helldivers lore. In a kind of ridiculous way, I found Helldivers to be a surprisingly thought provoking experience. 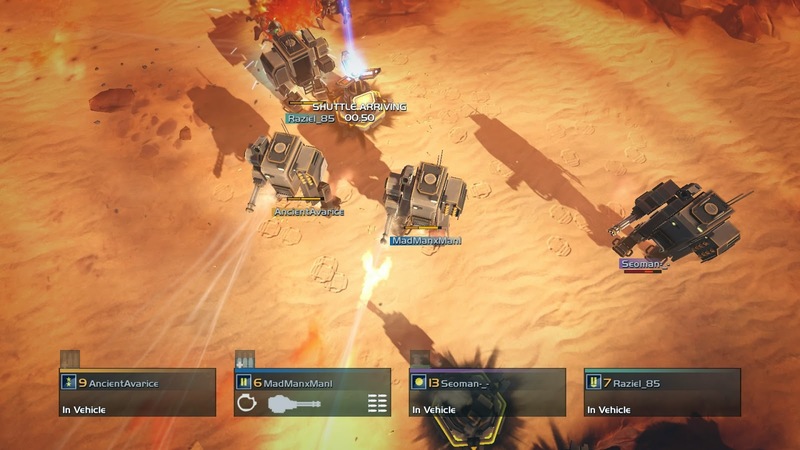 Helldivers is an isometric, twin-stick shooter where, calm, measured volleys of gunfire fire can transition into frenetic blood baths (often times human), in the blink of an eye. It isn't a particularly fast paced game, in fact you are rewarded for keeping a calm head amidst the chaos; anything more than a staccato rhythm on your trigger will send your shots spraying hopelessly wide. Furthermore, stratagems, the lifeline of a Helldiver, are called in battle by inputting a code on the direction pad (D-pad), which is perilously easy to mess up during the whirlwind of battle. Learning a code is rewarding, though naturally, the codes become more complex with more powerful stratagems, such as calling down mech suits. Although, core and essential stratagems, like ammunition drops, remain fast and simple. Which is great, because it is the kind of stratagem that you really benefit from being able to punch in quickly. 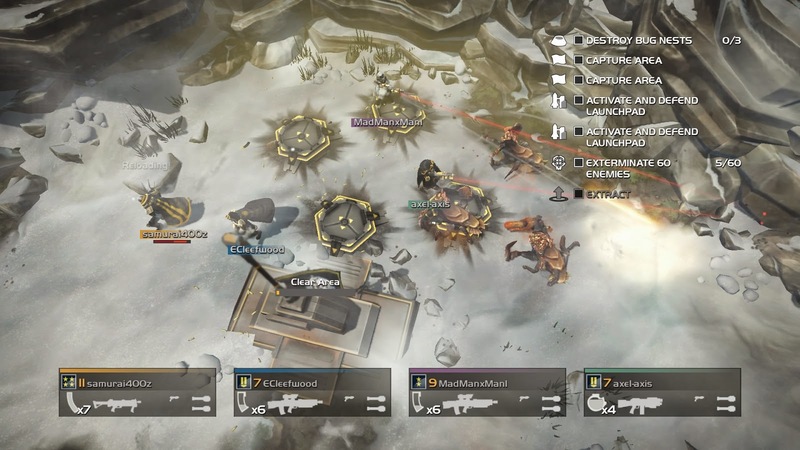 Helldivers is such a pleasure to play because even in the worst matches – and trust me, some of my death counts were impressively high – I never once felt that the game was to blame. The controls are tight and easy to learn, so you never feel like you are fighting against it. Responsibility was always laid upon me, or my squad mates. Did I mean to burn my comrade alive? No. Did my fellow player intend to kill me under the steel mass of his spare mech? No, probably not, but we did it none the less, the game doesn’t pull the trigger, the players do. In Helldivers death are usually the result of a dumb mistake, or a series of dumb mistakes; they are rarely unearned. Stratagems are essential to the success of all the Helldivers missions. Stratagems range from the mundane but necessary ammunition drops, to calling down indiscriminate airstrikes, and a trigger happy automated turret. Each Helldiver can take four stratagems into battle; one very generous player I was matched with carried multiple mech suits into every mission, allowing the whole party, regardless of level, to stomp around virtually untouchable, until the ammo ran dry of course. Stratagems, along with weapons, perks, and gear, unlock as you progress through missions and level up, and there is a good variety of all of them to unlock. Creating some different ways to approach the core combat; naturally a Scythe laser operates quite differently from a shotgun. While it can be played solo, Helldivers is meant to be played with three other players, that way you don’t only have to fear being crushed by your own stratagems, but also your squad mates’. Helldivers makes it trivially easy to find other players, I had no problem finding a group; whether I filtered through the open games, or people hopped into my open game. Aside from being exponentially more fun, groups collectively contribute more to the community influence, which decides the outcome of the war(s). Humanity is quite literally surrounded all fronts by; Bugs, Cyborgs, and the Illuminate. The wars are fought region by region, with Helldivers fighting on the planets within each region. 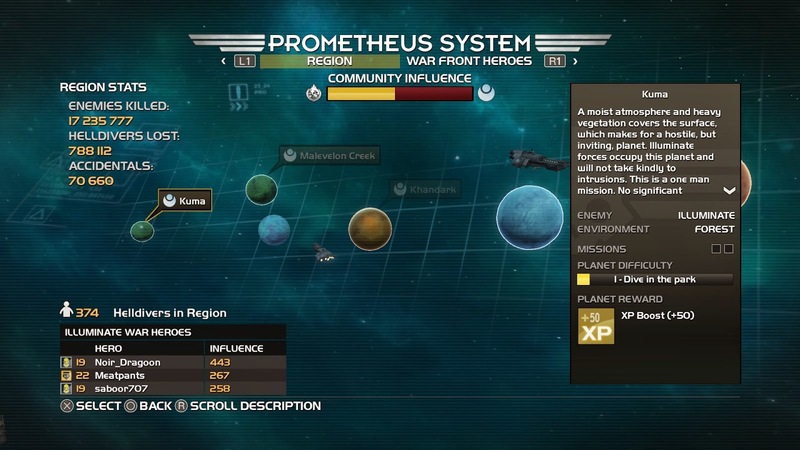 Completing missions raises the community influence, which determines who claims the region, humanity or the alien foe. Each front is a constant tug of war, with humanity and the alien faction trying to reach each other’s home world. The toll the war has taken can be displayed by each region, or by the war as a whole, to the nearest enemy killed, Helldiver lost, and ‘accidental’. There is also a list of the players who have contributed the most. Each excursion to a planet surface sends your squad after a set of objectives, including; activating SAM turrets, capturing areas, destroying nests, and so on, before bugging out in a dropship. Objectives often involve punching in codes on D-pad, just like stratagems, they continue to produce a sharp spike of tension as you try to rush the code, while not making mistakes. Destroying nests involves calling down, and priming, a nuke, giving you just enough time to escape - it’s a situation ripe for disaster. A frosty team of Helldivers will be able to move between objectives with little difficulty, by swiftly dispatching enemy patrols, it’s only when you fail to silence the patrols that events turn bloody. It is another instance of responsibility; you can’t very well blame the game for your death, because you failed to takeout the enemy calling for reinforcements. Each of humanity’s foes has their own quirks, by which, I mean preferred methods of destruction. The Bugs, the faction I fought the most, start from small, easy to dispatch scouts, who quickly introduce their larger, more chitin-clad cousins. Large enemies like the Tank bug require a more surgical and measured approach. The Cyborgs can shoot, the tactical implications are quite clear… The Illuminate are juggernauts by comparison. Even their most basic armoured constructs boasts powerful shields and lethal, albeit short-range, tesla weaponry. The Helldivers' righteous and patriotic demeanour has seeped into just about all aspects of the game’s presentation. While not technically mind-blowing, its vibrant and stylish appearance makes Helldivers a joy to look at; orange bug blood, searing lazers, and the muzzle flashes illuminate the more painterly landscapes. The music is about as triumphant as you can get, which fits perfectly with the boisterous, yee-haw voice acting. The most profound sound of all though, has to be the metallic ping of your gun magazine rapidly depleting; all too often it signalled that I had made a fatal error of judgment. The core gameplay is solid, the controls are tight, but what truly makes Helldivers a standout experience is the sense of player responsibility that is pervasive across just about everything you do. The game establishes rules, basic ones like bullets will kill things, falling objects will crush things. So when lo and behold the bullets you unintentionally shoot into your squad mate’s back kills them, it’s really all on you. You can’t blame the game for your mistakes, the game quickly escalates from the super easy early game missions, to what you might call brutally hard, but the fact remains; if you fail it’s because someone made a mistake. The code-based stratagems, and mission objectives, are great mechanics to ratchet up the tension in the middle of a firefight. The multiplayer community elements, and scoring, combined with the levelling and equipment unlocks, are compelling reasons to keep playing. And because Helldivers is cross-play, cross-save, and cross-buy, on the PlayStation 4, 3, and Vita, contributing to the war effort couldn’t be easier!